For students & teachers for that holly jolly time of year. Very flutey writing... and they flow, almost by themselves! Christmas Music for Flute Trio. Books 1, 2 & 3 for $25 (Canadian dollars) in pdf. And just lovely, have a listen to excerpts. (This is a live recording taken from a student-teacher trio last Christmas). These three volumes each create a 10 minute "set", totalling almost 30 minutes, for public performance or for holiday background music. The three c-flute parts are equal in difficulty (novice to intermediate) and they are in concert order already. The movements are slow-fast-slow-fast, to keep the audience dancing and singing along, and there are several unusually beautiful minor carols that bewitch and cause everyone to be slightly awe-struck. Just what you want in a flute concert! These magical trios are also sight-readable for professional concerts and quick to put together. Printed in score form, everyone can watch the other flute parts as the counter-melodies weave. Dynamics and phrasing are clearly marked. All parts are equal in quality. Solos appear in each part in turn. Practice track midi mp3s are available. (see below). The three books contain the following Christmas Carols in concert sets. The above Christmas Trio books are $25 for all three together sent as pdf sheetmusic. Just send me an email to let me know what you're ordering, then send $25 using the big yellow donate button on any of my webpages, or go to paypal.com or go to my donate page. All methods work: http://www.jennifercluff.com/donate.htm. And do you need midi practice tracks? If you and your trio need practice mp3s let me know. It's possible for flute teachers to email to your students mp3s of these carols for preparation, just add $3 (total: $28 for sheetmusic and mp3s) and I'll send you all the midi sound file of the trios in mp3. They are played by midi using Sibelius at A-440. They're great for prep beforehand for students; they can practice their parts in advance of rehearsal. Here are some page samples of the pdf sheetmusic. You can click on each one to enlarge it, then use back button to return here. Send me an email at jen(at)jennifercluff (dot) com with your order, pay with paypal, and then I'll send the pdf sheetmusic for your flute trio as soon as possible. Canadian or US dollars fine! My favourite published flute trio is Christensen's arrangement of "Carol of the Bells. A great duet and solo version of Carol of the Bells is in Howard Vance's Christmas Duet book which is super useful in lessons too, because it has so many duets that are "novice-intermediate". Vance also has other ethnic holiday books for flute duet with enchanting Jewsih melodies. 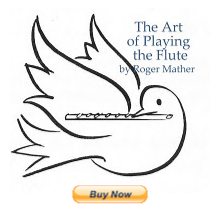 Just great for lessons in deep Folk flute! My favourite free online Christmas music trios are the Boismortier Flute Trios No. 1 and 5. Of the five trios, these two are the brightest and most festive for use as background music or concert material for teachers and students. Kummer Trios and standard Nutcracker arrangements can also good for background or showpiece music for a holiday gig for a professional trio; we usually interspersed classical trios with the above well-loved Christmas Carols. (we had to play in a castle once for three hours worth of 40 minute sets. Imagine!) But all these are good for long sets at Christmas time! Enjoy! Please do give the Celtic Trios a listen too when you're planning holiday trio concerts. Trios for C-flutes, the Celtic "Flutzalad" Suites arranged by Jen are also available (which also work well for Christmas concerts; lively and fun): Here they are to listen to and to see the parts.Scarborough Fair, Mari's Wedding, Dream of Arren, Mirielle by Gounod, The Morris Dance, Road to Listovaria. All these jigs and folk tunes are great for festive performances. Another use is forming trio groups from students who are overlapping their lessons by ten minutes. A teacher plus two students can play easy-to-read music or pre-prepare using mp3s of the trios. All these trios come with mp3s for pre-practicing. The individual flute parts then weave together beautifully on the first read for teachers/pro-players, but there is endless possibility to play them with even greater musicianship. So, thanks everyone who's ordering these, and let's make MUSIC ! Ah, Christmas in July These new trio arrangements are a real treat and so playable and appealing performers and audience alike. Your recordings of these are very well done also...as are your set Celtic Trios, which have a very special ethereal quality with great tone, intonation and style. Hey Jen....thanks for the Christmas music. I will talk to my instructor tomorrow. We are planning an outting with 3 to 4 flutes to play for retirement homes for Christmas. I think these would be perfect. I will email later this week to order this. Wish there were more samples. I was really enjoying just listening but can't wait to play them. Merry Christmas and thanks for all the advise you give on your web pages. The trios ARE great for older audiences, because they stay low in the flute's range. When you say: "I wish there were more samples" do you mean to listen to? Or to see the sheetmusic? All the carols are above on mp3; you can hear snippets of them all. Thank you for sending the Christmas Carol trios. We played through a few of them yesterday and they were perfect for our ensemble. What a great variety of familiar and also less common carols and they're a perfect level for amateur flutists! It's easier to talk to you though email. You're right; the donate buttons automatically fill out $22 for the Mather book, and you want to specify Xmas trios at $25. So email me.